This is the first Ghost Bike I've heard of in Sunset Park. 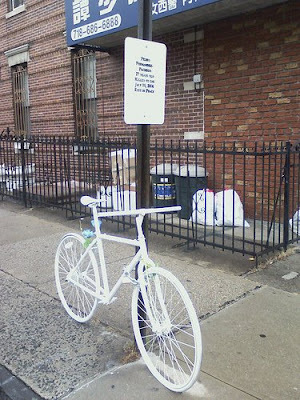 It's in honor of Pedro Fernandez-Pacheco, who was struck and killed by a livery cab on July 10, 2008. The Ghost Bike is on 54th and 7th. Thanks to Lauren Jaded's photostream on flickr for the photo. Watch out for those livery cabs. Just a couple of days ago a grandmother walking in Bay Ridge was hit and left in the street on Ridge and 75th Street. It happened a little after 7 PM on the 16th (Tuesday evening). She's in critical condition at Lutheran, and she's being treated for head injuries. If you saw or heard anything about it, please call the police with the information. Pretty basic ghost bike artwork, but pretty profound in it's value. It's unfortunate that a person chooses to hit and run when involved in an accident. I often wonder that had they pulled over and checked on the injured victim if they could have made a call to save their life.